The Lewes Public Library moved to its present location, 111 Adams Avenue, in June 2016 after almost 30 years in the previous location just across the railroad tracks. Construction of the new Lewes Public Library was a community effort and more than doubled the Library, increasing in size from 14,000 square feet to 28,500 square feet. While keeping many features of the old Library, such as the Delaware Room and Children’s Room, we’ve added many new features based on community input and the need for a true community center. These include additional meeting rooms, study/tutor rooms, a Teen Room with its own Tech Suite, a Children’s/Teen program room, a Computer Training Room, and more. 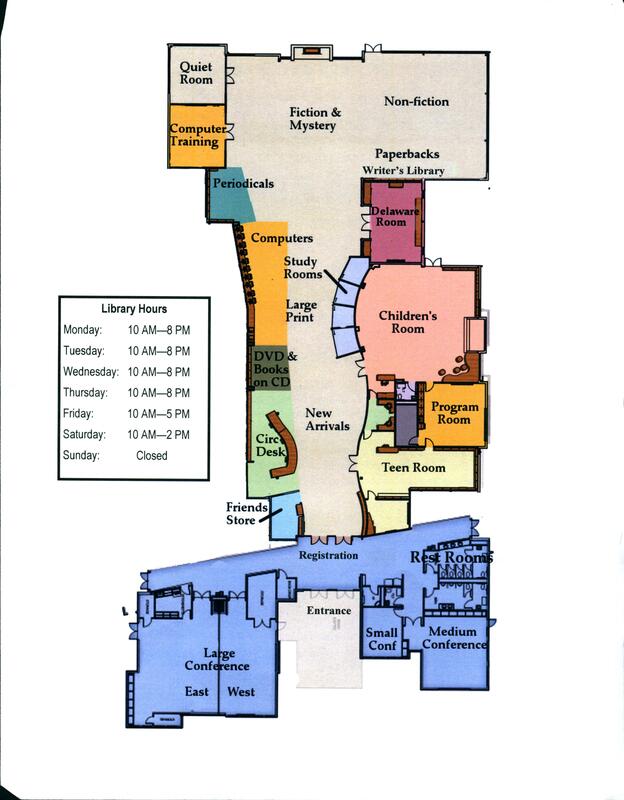 A map of the floor plan can be found here. The new Library is an integral part of an emerging 10-acre cultural campus at the southern entrance to Lewes, including the new Margaret H. Rollins Community Center and Lewes History Museum, outdoor concert stage, the Children’s Learning Garden, Stango Park, and hub for an 18-mile regional hiking and biking trail to and from Rehoboth Beach via the Junction-Breakwater and Cape Henlopen State Park; and, in time, west toward central Sussex County. The old Library was built in 1988 and in the year 2000, the library added two wings, the Research and Non-Fiction wing and the Children’s wing for the children’s collection and activities. Also added were a special room for the Delaware Collection and an enclosed reading room. Before the old Library was built in 1988, it was located in a room in the west wing of the Lewes City Hall. Prior to the City Hall location, it was housed for 30 years in the upstairs room of the Zwaanendael Museum. It had moved there in 1932 from the building which is now occupied by the Lewes Historical Society Museum Gift Shop at Third Street and Savannah Road. The Library is community-operated and is administered by a Board of Trustees of local citizens appointed by the Superior Court of the State of Delaware. The Lewes Public Library anticipates the needs of the community and adapts, creates and supports classes and programs for all ages that encourage a love of reading, exploration and discovery. The Library provides access for a wide variety of educational, informational and recreational materials to all members of the community through traditional resources and emerging technologies. The Lewes Public Library will be an exemplary library in Delaware and a trusted civic, cultural, social and learning center. The Library will be a welcoming, comfortable center for the exchange and creation of ideas, as well as the preferred place for cultural and social interaction in the community. The Lewes Public Library is an independent public library member of the Delaware Library Catalog. The Catalog consists of all the public libraries in New Castle, Kent and Sussex Counties, Delaware and other academic and institutional libraries. Visit DelawareLibraries.org for more information. The Library must raise over 44% of its annual operating funds each year. The three principal funders in order of contributions are: Sussex County, State of Delaware, and the Friends of Lewes Public Library. The remaining funds must be raised through gifts, grants, donations, fees, and fundraising. Click here for more information on how you can support the Library.